Searching for the Waldecks . . . Yoo Hoo! 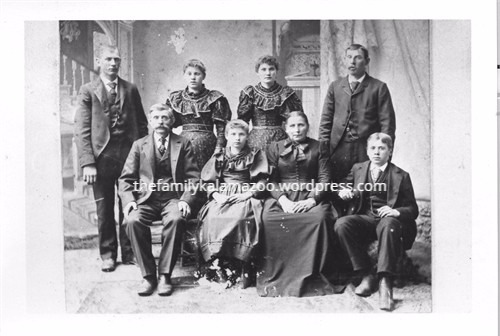 In my last post I wrote about my great-grandmother Clara Waldeck Mulder, of Caledonia, Michigan. Today I have a confession to make. The Waldecks are my most unknown branch of the family. And why? Waldeck is a fairly common name. There are two Castle Waldecks. Lots of places share the name Waldeck. There are many Waldecks listed on Wikipedia, including the first Waldeck, who was a count, and some Waldeck princesses. I bet there are a lot of paupers named Waldeck, too. 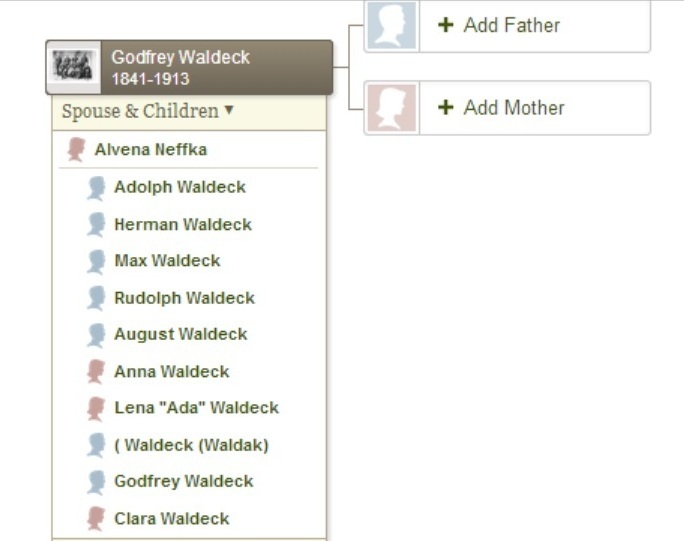 But so far I can’t find the town or region in Germany where my Waldeck family came from. Godfrey (Gottfried) and his wife Alvena (Alvina) immigrated to the United States with their family and then had more children. I don’t even know if all those children listed on this tree are theirs! Clara is. And so is Godfrey (junior) because I remember him when I was young. He managed a grain elevator or something like that, but he also farmed his own land. He was blind from glaucoma when I met him, and he still walked down the road each day and drove his tractor in the fields. As an aside, glaucoma runs rampant in their family. I know that Grandma used to like to go to the Waldeck family reunions, and I went to at least one myself, at a lake (of course). Look at Alvina Waldeck above. The tree lists her as Alvina Neffka, as if that is her maiden name. But is it? I’ve also seen it listed as Noffke and on her death certificate her father was listed as Louis Koffler. Her mother was listed as Dora Couch. Noffke is a German name, and so is Koffler. Neffka is not German. Neither is Couch. One person I’ve spoken with has wondered if the family was more Polish than German, but I have no proof of that either. I need some help with this and hope that somebody reads this blog and gives me some clues about the family! I am going to take a stab at identifying the people in the photo. Looking at this photo and the names, can we write off Adolph, Rudolph, Max, Herman? Are they not part of our family? Or were they older, born in Germany, and already living their own adult lives when this photo was taken? And why isn’t Fred even on the family tree?! You can see that I am going to need some help with this project! Jackie, I was really hoping you could help me, especially since I found out that the Queen is a Waldeck! hahaha. That’s what it says online . . . . 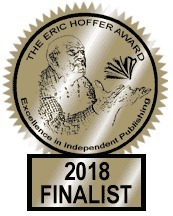 Thanks for your good wishes! The hard ones are for me the challenge which make this so much fun. My namesake Moore, is a line that I have run into so many closed doors. Have you thought about DNA? I actually did 2 DNA tests now, but am such a mutt that it’s hard to tell. 23andme did find a gene that for sure is Polish, and Ancestry found a huge percentage of eastern European, which is even more than would be accounted for if the Waldecks and Neffkas were completely Polish. So very confusing and especially so considering they self-classified as German. I was wondering if part of the reason it’s difficult is that Moore, like Waldeck, is too common a name. Thank goodness it’s not Smith :). Moore has been in the top 20 most common names in the U.S.A. and higher in Ireland. However I have not traced anyone in the Moore line back to Ireland. The hours I’ve spent looking are way too many. I hear you! You also never know if somebody changed the name at some point and then that makes it even more difficult. Ah, don’t you just love puzzles with missing pieces? Good luck. I feel your frustration! I do love puzzles, but I like solving them even more ;). I feel as if I might have found a clue last night . . . . Keeping my fingers crossed! Good luck! I’m in the middle of trying to find some info on one of mine! Isn’t it fun finding more and more branches of your family?! I’ve discovered so many surnames that I’ve lost count. One of them (Berkeley) traced back to Berkeley Castle in England. I’m glad you found a castle in your background too. Cool! Ooh, exciting!!! I don’t know if our name goes back to one of the castles, but you never know! I have a friend whose father grew up on the Poland/Germany border. He says that he doesn’t know if he’s Polish or German because the border changed after each war. Maybe your relatives are from the same area. I am starting to think this is true, and I have a clue which I am pursuing! !